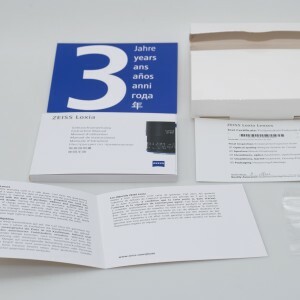 Zeiss Loxia are manual operated lenses with electronic transmission of data to the camera where they are recorded in EXIF. 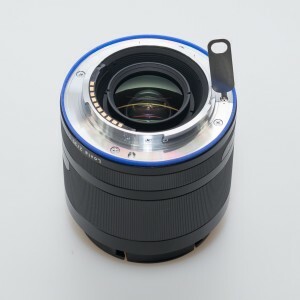 That is fairly unique in the recent lens offer for E-mounts, because all previously available lenses in the native E-mount where either fully manual without electronic contacts (Samyang e.g.) or fully electronic, where manual focus is so-called – by wire, electronically coupled with the AF motor. 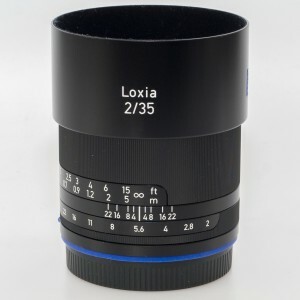 Zeiss Loxia 35/2 is based on the Zeiss Biogon 35/2 ZM, featuring optical correction to deal with Sony A7/r/s/II sensor protection glass refraction, which causes image quality problems with some 3rd party lenses. 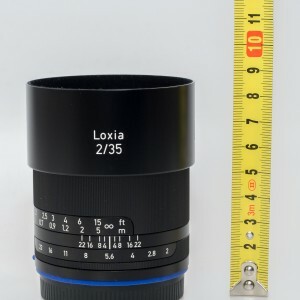 As written above, Zeiss Loxia 35/2 is Biogon design and it is very similar to Biogon 35/2 ZM. Biogon is symmetrical (or semi-symmetrical) optical design, created by famous Ludwig Bertele around 1935. 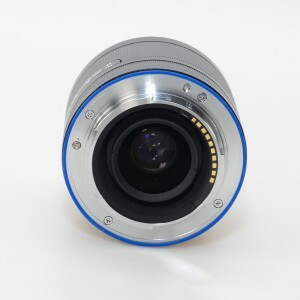 Biogon become popular for wide-angle focal lengths especially for range finder cameras, because it allow a wide field of view but still compact design. Biogon lenses are also known for rather flat field curvature and minimum distortion. However, due to the symmetrical design, edges of the image projection are created at quite oblique angles and due to the extremely short flange distance of native Sony E mount, and character of recent sensor technology, quality of the image suffers, especially in the corners. That’s where Loxia comes with improved formula to deal with the problem. 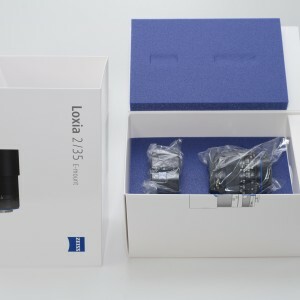 Lens comes in a massive paper box (relative to the lens size). The box itself is very well made and will immediately suggest that product inside is of a special quality. 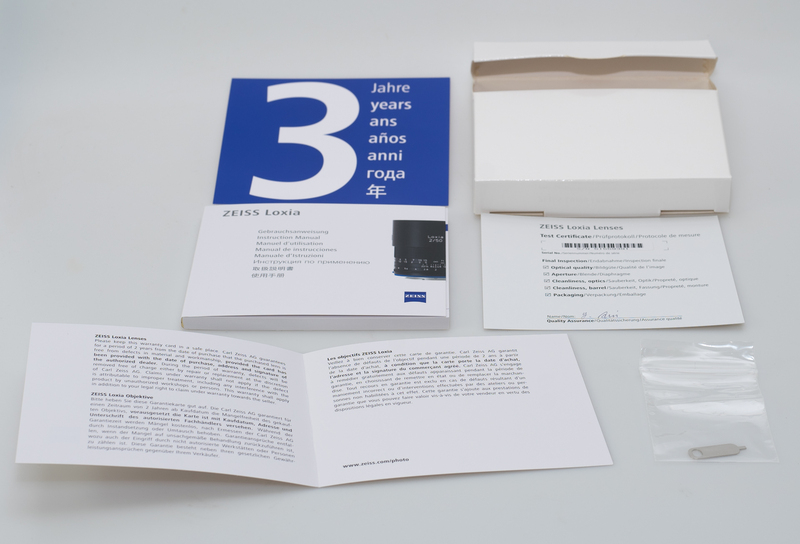 Inside the box there is lens, lens hood (metal with bayonet), warranty card (3 years in Europe), quality control check card with a hand signature of the controller, instruction manual and de-clicking tool (later about that one). Everything is packed in the blue (company color) polyurethane foam. The whole package somehow express what I recognize as a German premium design – puristic, functional, clean and solid. 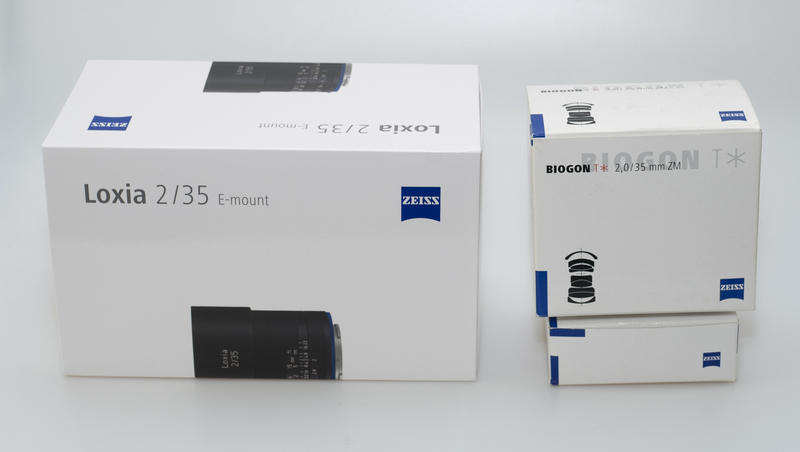 To get a better idea about box size, I made a comparison to a package of Zeiss Biogon 35/2 ZM, the lens that should be very similar in optical design and has also similar pricing. To be fair, I also included box with the lens hood (in the 2nd image),which should be purchased separately for this lens. Difference in the size and quality of package is significant. 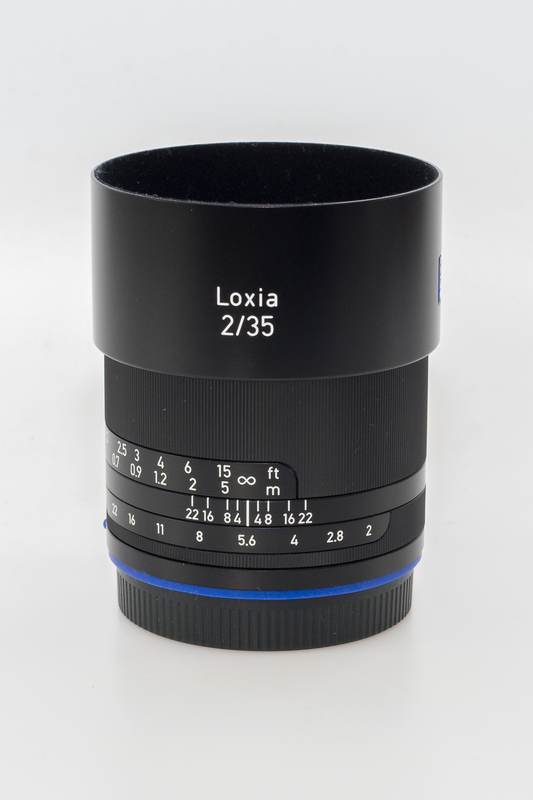 Zeiss Loxia 35/2 is made of high quality light metal and glass. 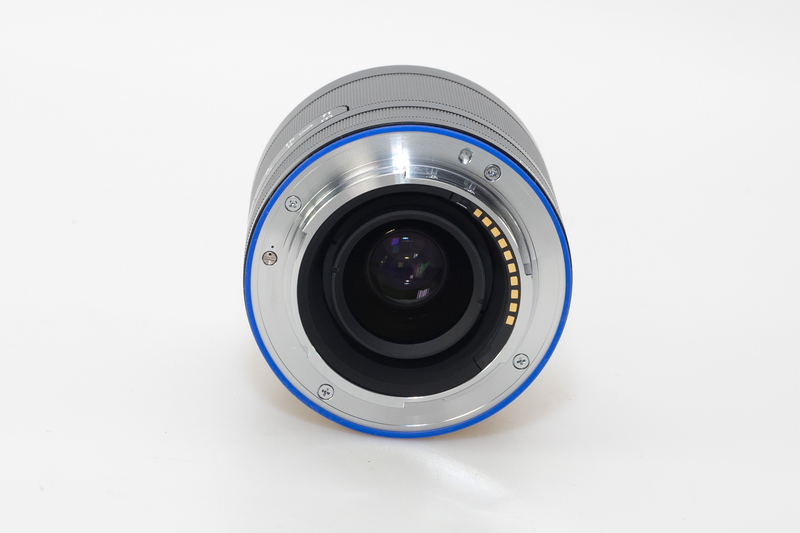 The only other material that can be found is a blue (company color) rubber sealing gasket ner the lens mount. While Zeiss Loxia is not claimed to be weather sealed, this little detail will certainly help keeping dust and moisture away from the electric contacts and sensor. 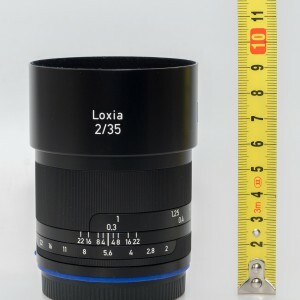 Loxia 35/2 is medium size standard lens. 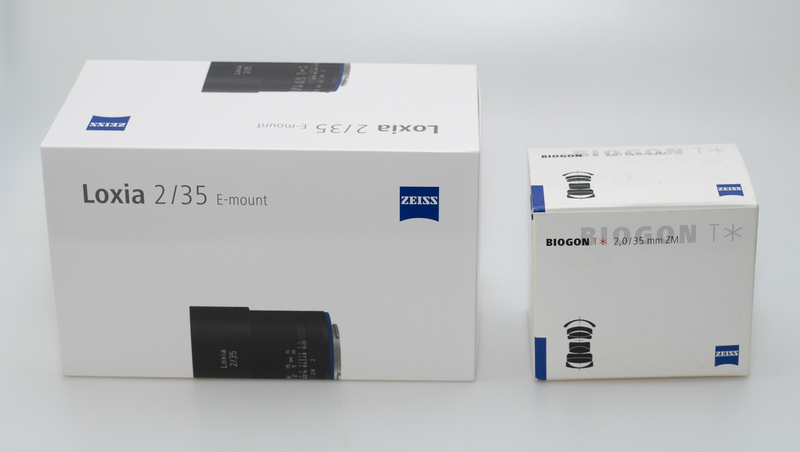 I have seen much smaller 35mm lenses, such as its own brother Biogon 35/2 ZM e.g., but I have also seen much bigger ones such as Zeiss Distagon 35/2 ZE (for DSLR). Here are few images comparing size of the 4 lenses, all more or less related to Zeiss and Sony FF E mount cameras. and with lens hood mounted. 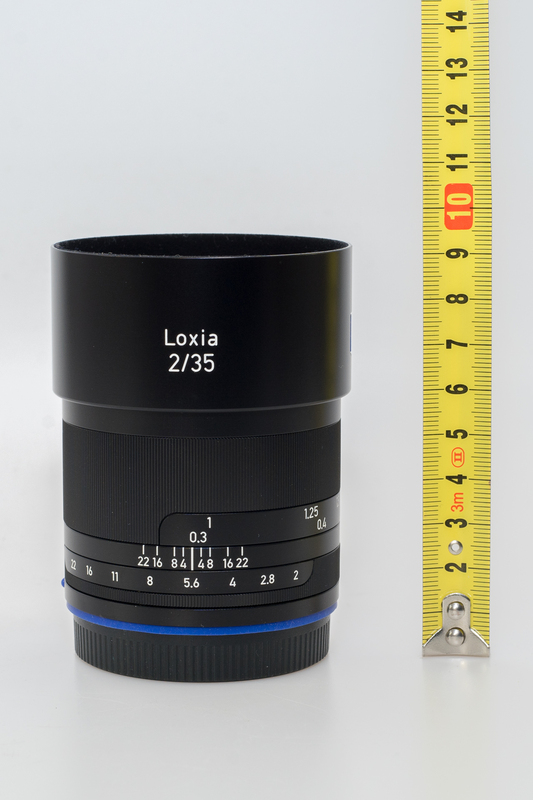 While Loxia is just a little bit taller than Biogon ZM (they should be equal when Leica-M to Sony E mount adapter is used), it is also noticeable wider, similar like Sony FE 35/2.8 ZA. Contax G Plannar is smaller lens from those fours, even with the appropriate adapter (but differences are quite insignificant). It’s interesting to look at the design evolution of those lenses. Loxia comes in the retro-modern design which looks very appealing, with Sony FE 35/2.8 looking also futuristic but Plannar 35/2 doesn’t stay far behind (especially considering its age). However I am conservative guy, so my hand will always grab traditional but beautiful Biogon ZM first, if judging only by look itself. Lens hood is very well made, but surprisingly big IMHO. It is bayonet type, unlike Contax Plannar which is screw type. (but very small and compact). Mounted on the Sony A7 camera, Loxia looks very nice and it’s perfectly balanced. 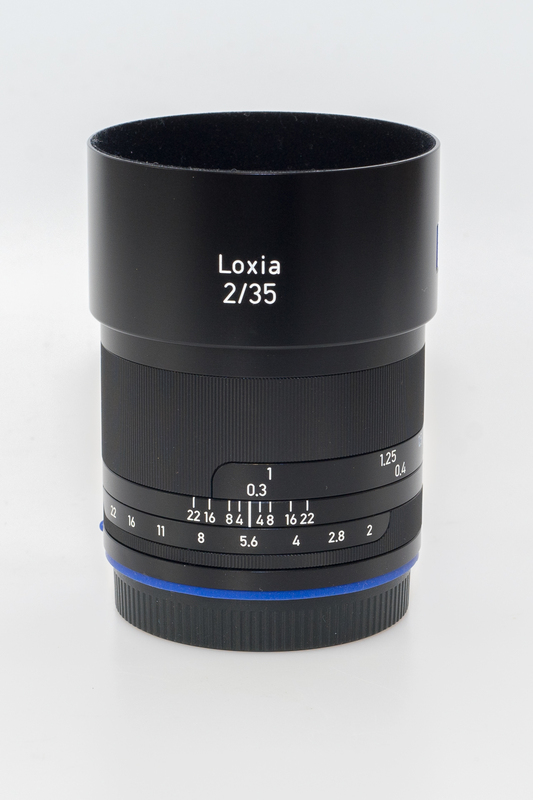 Zeiss Loxia 35/2 Biogon is a joy to hold and use. Made according to the highest quality standards and using superb metal composite for housing as well as solid stainless steel metal mount, Loxia features full manual focus and aperture control with some innovative features. While focusing is not electrical (by wire) it can still be used to activate focus assistant on the Sony cameras (automatic magnification of the image on the viewfinder) and it reports focus distance for the TTL metering. 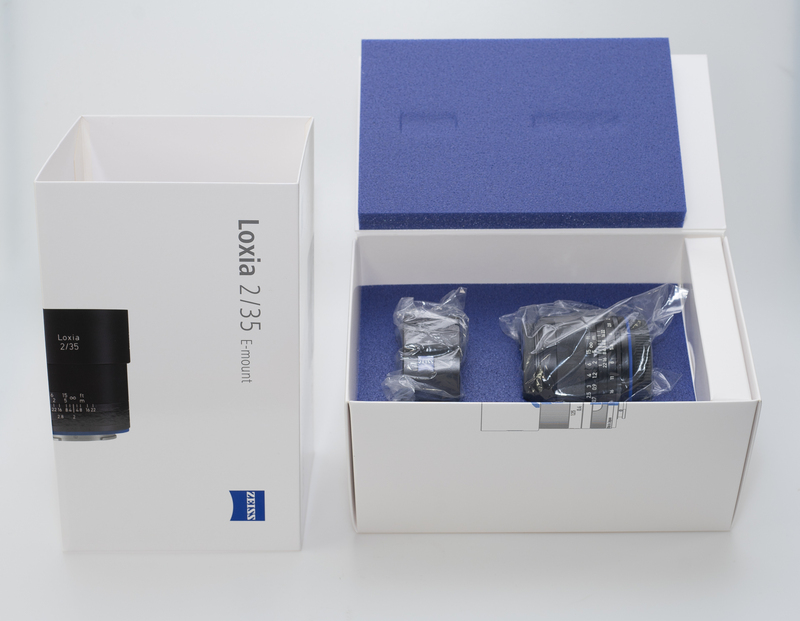 Lens thus combines best of both worlds – superior precision of manual focusing and proper engraved distance scale that is very useful for Astro photography or hyperfocal settings, with the benefits of modern digital technology such as full exif record, focus assistant activation or auto flash photography. 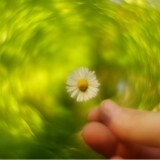 Aperture ring has so-called de-clicking function. It means that normal behavior of 1/3rd EV click stops can be easily changed to smooth, click-less operation. This feature is useful mainly for video and while aperture itself will be seamlessly opened or closed, 1/3rd EV values will still be reported to the camera. Accessory that comes in the box, a little screw driver with Zeiss sign engraved is de-clicking tool. You can of course use any screw driver with appropriate head size. To de-click or re-click aperture, simply turn the little screw on the lens mount side. 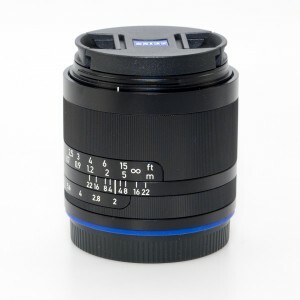 Lens extends slightly bellow 1 cm with focusing; it’s shortest at infinity and longest at minimum focus distance of 0.3m. Metal focus (above) and aperture ring (bellow), both have partially applied ribbed profile for better grip. Focus is smooth but I have feeling that Loxia 50/2 has a little smoother rotation. Full turn takes 180°which allows very fine and precise focus adjustments. Distance scales is engraved in white in both – feet and meter with DOF scale. There are no IR marks however. Aperture goes from maximum f/2 to minimum f/22 in 1/3rd stops which makes it exactly 22 clicks in entire range. I have however a little complaint related to the lens hood. While its mounting is easy and it stays perfectly in place, it also reduces the grip space for the focusing ring and especially focusing close to infinity is less convenient with hood on. I tried also focusing with one finger, but 180°is hard to cover in a single move. This is probably the only area where I can imagine slightly better design solution though. 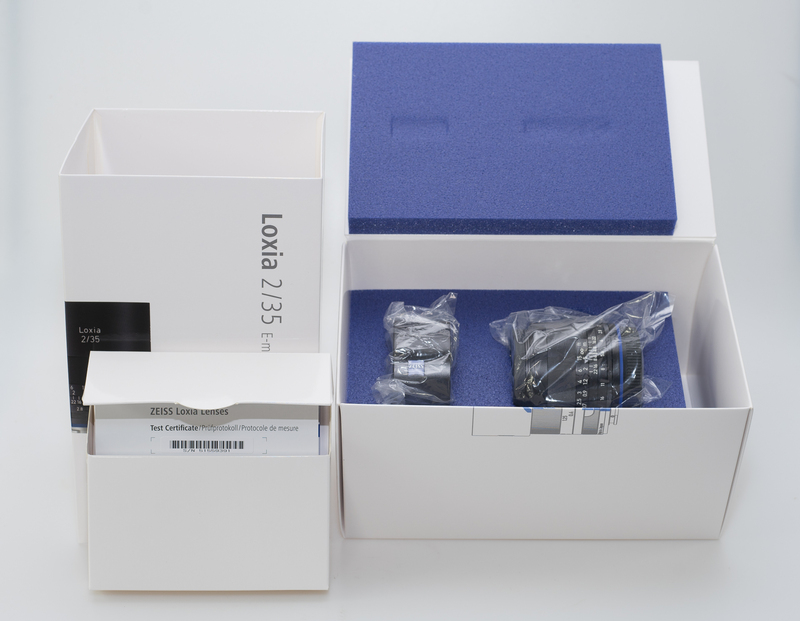 Before we move to image quality, take a look at the Loxia 35/2 from different angles. I wanted to hear your take on the 35/2, as for some reason, I find it more compelling than the 50/2. I suppose it’s because I already have the 55/1,8 Zeiss, which is excellent, and that I favour wide angles. Though I hope that Zeiss bring out a Loxia in the 20-30mm range somewhere, I might consider looking at this 35/2, if the rendering is nice. I don’t really need full EXIF—I can append it later, though it is quite nice to have in real-time of course. I’m interested to know how this lens preforms on the A6000. If the sensor on the A6000 corrects cornering smearing with an angled lens on each pixel, does the Loxia 35/2 then introduce corner smearing (from essentially a double correction)? 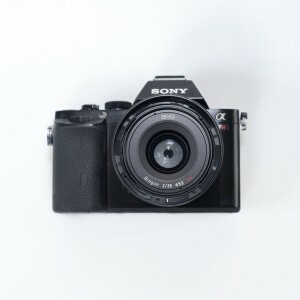 And what happens if Sony changes the sensor protection on future full frame cameras? Would this lens then only be suitable for camera models before the change happens? It might be that the cropped sensor of the A6000 is too small to give a definite answer. Perhaps comparing the corner smearing of the NEX 7 and A6000 with the Loxia 35/2 could give more useful results. could you please send me the A6000 samples, too? I’m also greatly interested with your result. Hi Victor. Always a pleasure to read your opinion. I like to ask you a question. I am not sure, if you had a chance to use Voigtlander Nokton 35/1.2/ II. I ha d FE 35/2.8 and while small and sharp, it wasn’t fast enough for me. So, Voigtlander, here I came. I like the lens a lot, fast and relatively small, but is bit too heavy and I like to avoid fiddling with EXIF every time. Loxia may be the answer here, but like to get another opinion, before I sell Voigtlander. Thank you for any advice and hope to read rest of your review soon! Hi CalBoy and thanks for your comment. I am just preparing few comparable (field) shots between Loxia 35/2, CV 35/1.2 II, FE 35/2.8 and Distagon ZM 35/1.4, so it might be perfect for you to check it by yourself. I hope to do it very soon, at least partially. My opinion is that CV 35/1.2 II is a lens that is softer wide open than other three, but it has very distinctive subject separation and I don’t mind that bit of softness in most situations. Loxia is softer too wide open at distant subjects, but they all get close around f/2.8 where FE Sonnar starts. 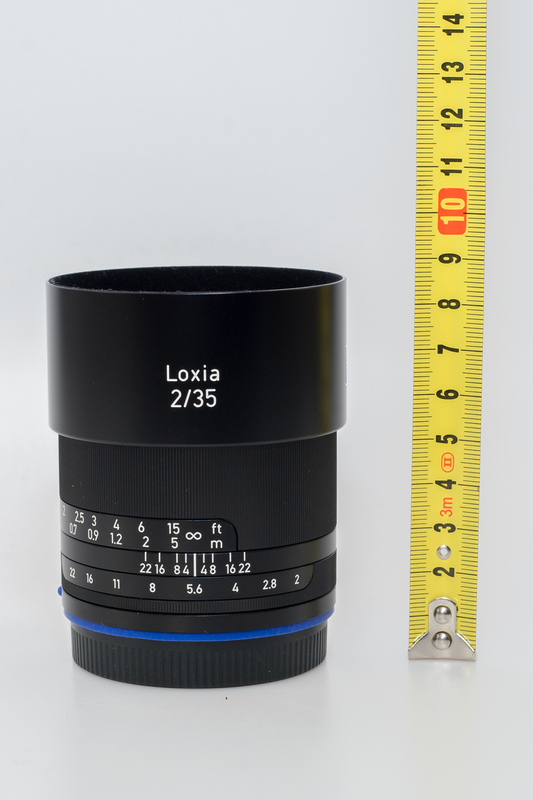 Loxia is however not much smaller nor lighter than CV 35/1.2 II, but it is somewhat more compact and easier to handle. I am not a big fan of those super sharp, super crispy lenses, so for me, CV is a great tool, but you can’t go really wrong with any of them. Consider speed, price and your intended use and style before you make final decision. After you check those upcomming comparable shots, let me please know what you think. And if it’s not too much trouble, could you add an RSS feed of this site? Don’t want to miss anything! Hi Pontus and thank you for the comment. I am working on it, but it’s been a bit hactic lately, so It might be delaeyed a bit. I will ask our IT manager about RSS feed possibility. Thanks for the tip Martin, and thanks for looking in to it Viktor! Unfortunately i use TinyTinyRss, so I will wait for a possible RSS update to the site and continue to look out for new stuff on flickr and twitter Viktor. Thank you one more time, especially for the last part. Similarly to you, I am kind of shallow DOF junkie. While the difference between FE 35 and Loxia wasn’t that much to my eyes, CV, at F1/4 was much, much nicer to me. As I already compared by myself FE and CV, I am afraid, I see no reason to get it at this time. I will be waiting for the predicted FE 35/1.4, but so far seems to be price/size prohibitive. I really appreciate the time you took to do this fine work, it help all of us to make more educated guess regarding this (and many others as well) lens. For me, I will stick with Voigtlander, seems like the Loxia, while a fine lens, doesn’t provide enough shallow DOF for me. 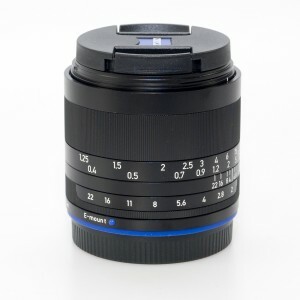 Did you have plan of review the fe16-35F4? I wanted to, but the lens is still not available here and Sony didn’t send us testing sample on time. I have no interest in testing it therefore, but I will probably buy it for myself and use it in some other comparative reviews. The same problem is with Sony A7II. We would like to review Sony stuff, but they would need to send it to us prior to official release. Only that way we can ensure enough traffic to partially cover for our time and effort. We will focus more on some other producers, but will keep using Sony for some comparative lens reviews. But I have a question, wil you review the Zeiss distagon 35/1.4 ZM on Sony A7. thank you for your question. I am working on that review, and first part should be finished till the end of the week. Thanks, very much for your detail review and Merry Christmas to you. A while back we traded a few comments on some old and compact lens on the Sony camera. Just wonder if you may still have the Leica C 40mm f2 for comparison to the Loxia 35mm f2. Or maybe the Leica R 50mm summicron to the Loxia. I have both of the lenses mentioned, but I don’t have Loxia 50/2 anymore. It is quite hard to make field comparative shots at same conditions and thus I always have to choose just few of lenses for the review. The similar situation is with Loxia 35/2. When it comes to Loxia 35/2, all I wrote above stands, but there is something appealing about its rendering, probably in regard to subject isolation, so that lens is IMHO more unique. 35mm is however very different FL than 50mm and difference between 35mm and 40mm is probably more significant than difference between 40mm and 50mm, so I am not sure how much they are directly comparable. That gives me a really good perspective and I am looking forward to your comparison between the Loxia and the new ZM f/1.4 version. Just re-read the whole review again, as I try to think whether this lens would be worthy of getting rid of my RX1 or not. Maybe not, but we always like a change, do we not? I quite like the sonnar 35/2.8, for what it is. I got mine in a bundle; I probably wouldn’t have bought it separately. Having handled the Loxia 35 thoroughly, what would be your take on getting rid of the Sony FE35/2.8 in favour of the Loxia? I primarily shoot with the 35mm and never use AF. I use the A7R+FE35 for architectural and interior stuff, both handheld and on tripod. I’m mainly after razor-sharp images with minimal vignetting, I guess I usually start from F8 and on, and rarely go into F2-F4 range. 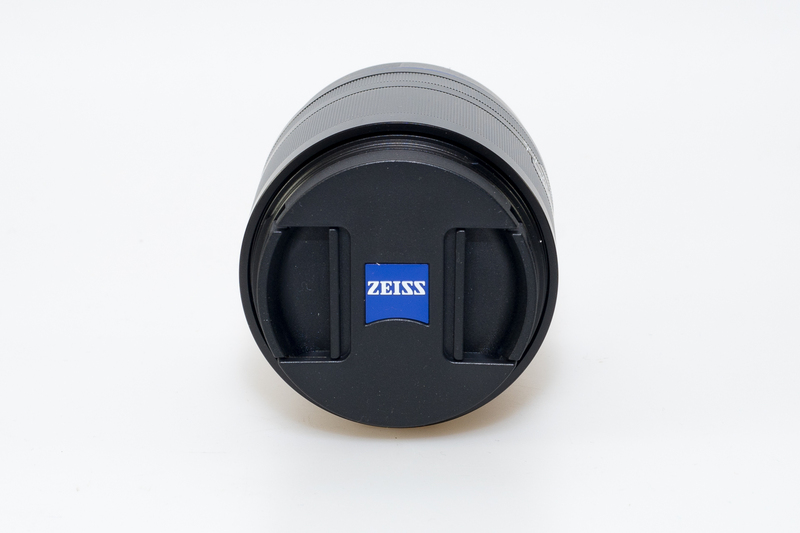 I also love the Zeiss ‘pop’. Would I benefit from the switch (if we omit the financial side of things) if we only look at image quality? As I’m sure the Loxia ergonomics and build quality surpass the FE35. Thanks in advance! If you are after razor sharp images, Loxia wide open won’t make you sing. On the other hand, vignetting is really well controled. At f/2.8, you’ll had hard time to distinguish between the two with Loxia being slightly better in the corners. It is always hard to give suggestion like this, because we all have different criteria of what’s good enough, but Loxia is great lens for many applications but not super sharp wide open. Among the benefits I would list low vignetting, great flare control, rather flat focus plane, nice micro-contrast and Zeiss colors. Put on top great build quality and nice de-click feature for video and you have very good 35mm lens for most situations. If you want razor sharp 35mm lens from wide open, check Sigma 35/1.4 Art or my recent favorite – new Zeiss Distagon 35/1.4 ZM. The latest is damn sharp at f/1.4 already, with just extreme corners falling apart (not becuse the lens, but because the sensor cover on Sony FF E mount cameras). 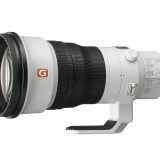 That is trully amazing (and very expensive) lens to own. 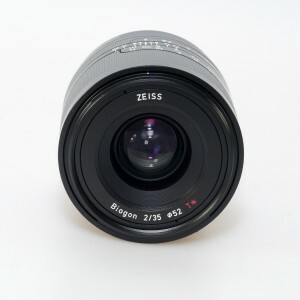 If you don’t mind larger size, you might also wait for Sony FE 35/1.4 ZA (zeiss Distagon), which I believe will be fantastic lens too and cheaper than 35/1.4 ZM. To answer your question directly – don’t switch FE for Loxia if the sharpness wide open is one of your key criteria. Do it, if you value other attributes such as low vignetting, low distortion, better ergonomy, more even sharpness across the frame and you shot video. thanks a lot for such a thorough response and recommendation! I definitely value the things You mentioned more than sharpness wide open, so I’ll be purchasing the lens soon. In any case, it’s a fantastic lens to own in one’s collection, comparisons aside. Again, thanks a lot and all the best! Just wanted to drop by and thank you again for your review and comments. Just received the lens today, played with it for a couple of hours and all I can say is that it is glorious. Not ideal by any means, but very exciting, I would call it. It provides a very old-school rangefinder kind of experience, there’s always this urge to leave the tripod and go handheld. I think its biggest upside is not the optical quality, but the reenergized experience it provides, so thanks again for your help! 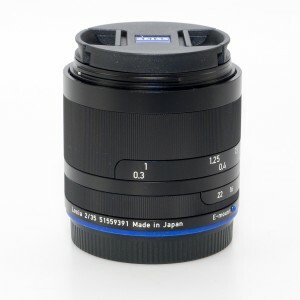 Why did you fake the bokeh of the CV 35/1.2? It’s very obvious that you’ve blurred the background since we can see the edge of the applied blur. No lens gives such a smooth bokeh. Ah, so now you switched to the real images, so that my comment should look like it was I that was wrong. Your reviews are very good, and there is no reason to make them non-trustworthy, right? Hi Makten and thank you for your initial comment. In the “sample images” part of the review, all images are post processed as I would normally do, which usually means – heavilly post processed. In this part of the review, it is not about RAW lens data but rather about final output that I was able to achieve. Sometimes however it happen, as in this case, that I upload wrong version of the edited image (it also happen in the official part of the review unfortunatelly), because it simply takes lot of work to complete those reviews and I don’t have fool proof system to avoid similar mistakes. I am always glad when my readers point out on some of potential faults, so that I can double check and post a fix if needed. In this case, I indeed found that wrong version of the image went up and replaced it with the proper one, thanks to your initial comment, but I forgot to thank you here. Sorry for that, you were right and your initial comment helped to fix it out. Please be warned that I might make similar mistakes (I did in the past) even in the official part of the review from time to time, especially wrong descriptions or mixed images. We are trying at Verybiglobo to prevent them of course, but our team is very small and our possibilities are limited. Help of the community is thus highly apreciated. Sorry if my mistake makes any inconvinience to you, and I wish you lot of great shots in the future. Incorrect: Biogon is NOT flat field inherently. If it were, then all legacy Biogons would be perfect for A7 series. The Distagon is flat. For Loxia, Zeiss has done some nifty engineering to make the Biogon flat field for the A7. 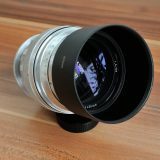 We must wait for critical reviews and tests to see if this lens lives up to its hype and price. 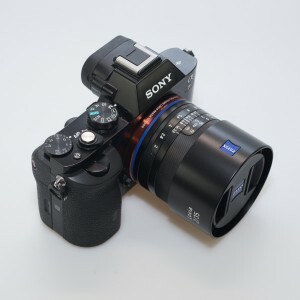 A lens for the A7 that has no autofocus? No OSS? How can you call this specifically designed? More like specifically adapted. Zeiss needs to do more. I honestly doubt to see critical rewiews from respected sources, but if you value AF and/or OSS, attributes, their lack are features of this lens and not shortage, Loxia is certainly not for you. 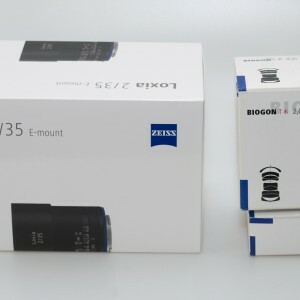 You might want to wait for the new Sony Distagon 35/1.4 ZA, go for already existing Sony FE 35/2.8 ZA or search for another option in A mount e.g. While on that, you should also look for the free review site, that will better suits your ways. a) sample variation (as you mentioned). You could have sub par Loxia or I can have sub par Sonnar. b) testing at different focal plane distances. Loxia is optimized for medium distances (2-5m). I don’t know about Sonnar (I can’t get in touch with their representatives on any interest) Loxia optimalization is for typical reportage/street photography. Difference in sharpness at different focal plane distance are significantly influenced by lens focal distance optimalization. Almost as stopping aperture down. But in my tests (as you can see above) Loxia was sharper at all comparable apertures even at infinity and especially corners were better from f/5.6 and smaller. Whatever the reason is for different results in our tests, I think we can agree that sharpness differences in comparison are rather field irrelevant in a real life use. BTW, Loxia is not a modern design, in fact it is rather “classic” Biogon design (with addition of corrective optics for dealing with Sony sensor cover glass). Mr. Nasse from Zeiss confirmed that when I asked about highlight glow wide open. 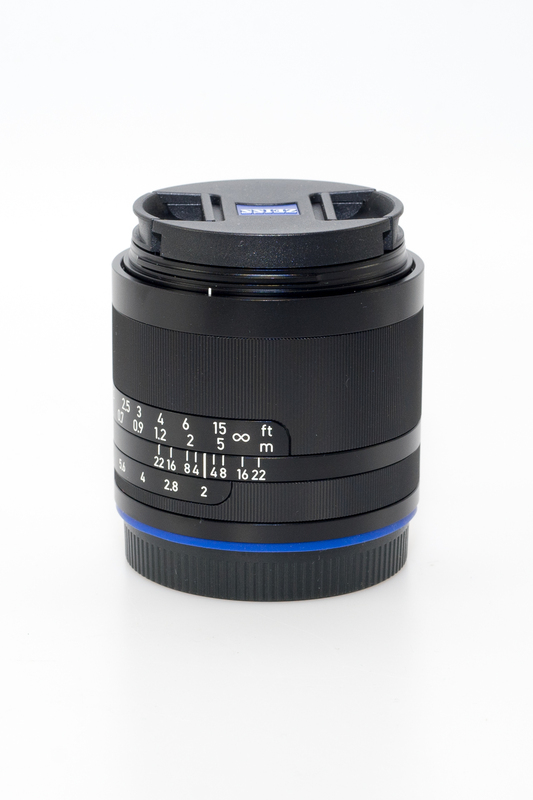 Sonnar 35/2.8 is modern design, optimized for sharpness at its widest aperture. Thank you for sharing and keep good work coming. Thank you Viktor for the great information! 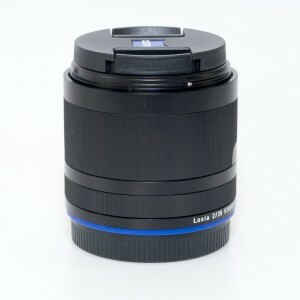 We are fans of your lens reviews and we hope to collaborate with you in the future. Thanks guys. Looking forward to share our findings and conclusions. When I hover on the images, they only go dim. When I click on the central little circle with left/right arrows, nothing happens. 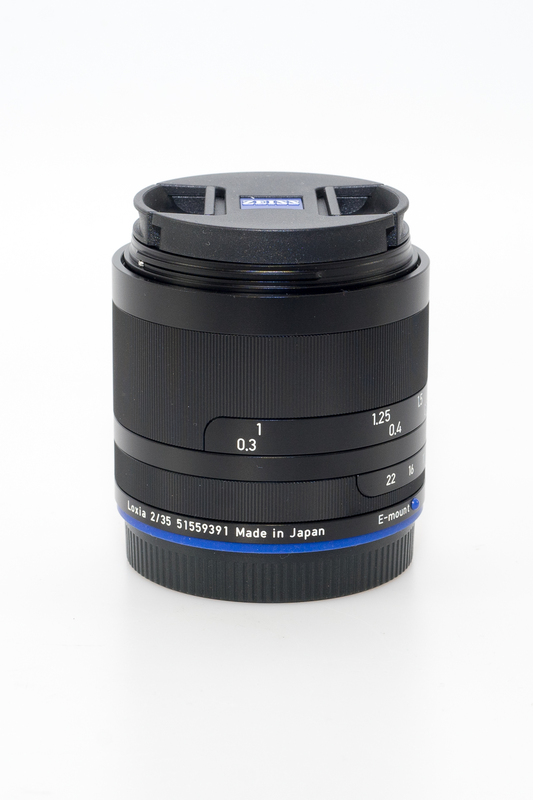 I cannot also find the images taken with the FE ZA 35mm f2.8 to compare with the Loxia. I tried this in both Firefox and Chrome and same result. Am I missing something here? I hope that you will now be able to see both images and compare them. 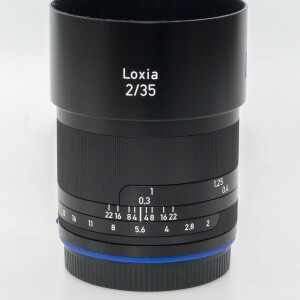 Regarding Loxia 35/2 vs FE 35/2.8 Sonnar, did you look at all pages of the review? There are at the end of the page tabs to go to the next chapter. You should find comparisons in the image quality part. What are your thoughts on the way this renders compared to the 50mm Loxia? if you ask about colors and contrast, both Loxia lenses are similar. They differ a bit in bokeh, but that is to be expected considering different focal length and optical construction. Thanks. How about micro contrast and sharpness? Hi Dave, I guess you have read my Loxia 50/2 review, so you might want to make your own conclusion. 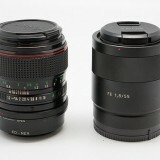 In my opinion they are both nice classic lenses, not bitingly sharp wide open but improving a lot when stopped down. Micro contrast is high, but not as with some more modern designs, which I personnaly like, because for portrait I don’t want too much contrast and if I shoot landscape I tend to stop the lenses to f/8 and smaller. Thank you for your very informative lens test and comparison. – In your overview image of your test chart, I see a reddish cast in either side of the image. This is also confirmed in a crop of the area at bottom left (Area D) in comparison to all the other lenses. In the first image of the whole test chart, the Digital Color meter of my Mac gives readings of RGB=220/220/220 or close to that; in the reddish area, it says something like 203/182/176. 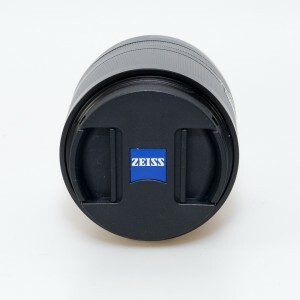 It may look like Zeiss has not QUITE succeeded dealing with the infamous color cast of Biogons when placed so close to a high res digital sensor – ? I am quite sure that in camera software correction is responsible for dealing with color shift. 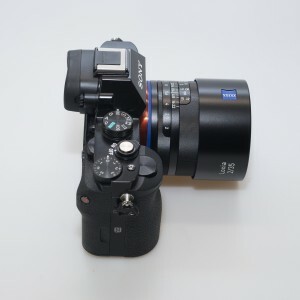 A great review, but I question sony and zeiss sealing methods. 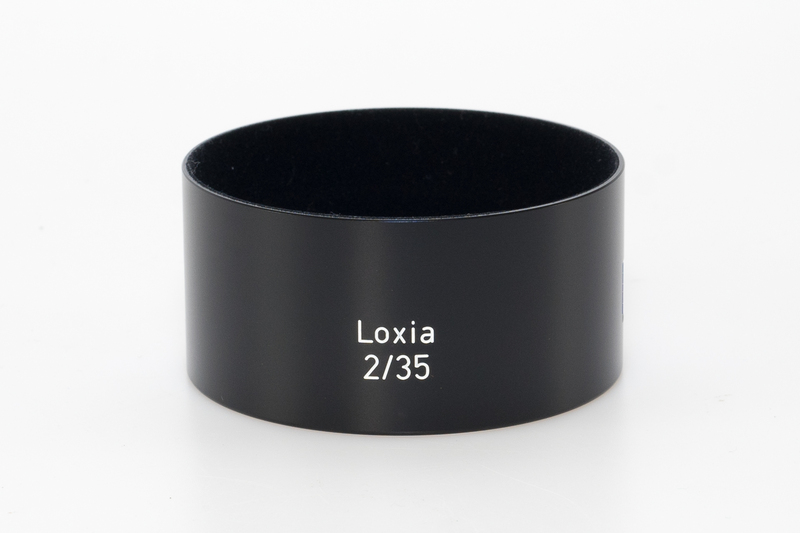 Loxia’s have a rubber gasket, but no sealing elsewhere in the lens. Some FE lenses have sealing, but no gasket on the end. FE are also getting designed with imperfections to be corrected in post, and I would understand this if they were lighter but take the 24-70 for example, it is no lighter or cheaper than the canon equivalent. People slate canon lenses but if you compare same generation, they are often so much better than the competition. 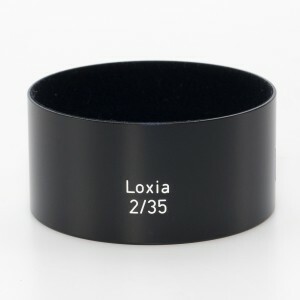 It might be a bit confusing, but Loxia lenses are supposed to be environmental (dust and moisture) sealed. Just like Canon weather sealed lenses, any lens that is weather sealed needs front filter (protective or UV) to improve sealing from the front side. (Deep lens hood helps too when possible, because it prevents water drops to stay on the filter. I sent my test samples of Loxias back, but I wouldn’t recommend anyone to pour water on the lens. That would be very bad idea, because at the first place – Sony E cameras are not weather sealed and also – pouring water is not what most producers understand as weather or environmental sealing. Even my best Canon lenses (big whites) might not survive direct splash of the water. If the lens drop to the river e.g., it would void the warranty and Canon will refuse to even repair it (because of possible proceeding corrosion). 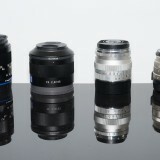 Sony FE lenses, including those with Zeiss badge, are produced by Sony and Zeiss has no influence on their final appearance. They basically help Sony with computer design and they test final lenses to see if they are within projected optical specification. Did you have the occasion to compare the Zeiss 35 ZM 1.4 with the Leica Summilux 35 FLE 1.4? Thanks and have a good day! unfortunately not directly, but if the sharpness across the frame is of the concern, Zeiss looks better to me. Lux is however another outstanding lens, especially regarding contrast and colors. I keep coming back to your site and reviews as they are so instructive! 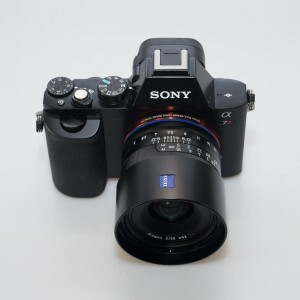 Did you finaly try the Sony FE 35mm 1.4 ZA? 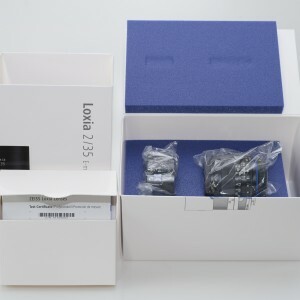 Comparaison with the Loxia 35 should be interesting. Yes I own the 16-35 and it is really superb! I enjoy it very much as I shoot wide most of the time. The sharpness, rendering and colors, everything is there with the ease of use of a zoom! I’m looking for a 35 mm though with a wider aperture… Loxia 35, FE 35 1.4, Zeiss 35 ZM… I don’t mind the size of the Sony 1.4, so it might be my next choice if it’s really better than the Loxia. Hi Fabien, FE 35 1.4 is not really “better” than Loxia IMHO, it’s different. If you need AF and f/1.4, than it is possible option, but Sigma 35 f/1,4 Art is actually better optically corrected and cheaper too. If you don’t need AF but do f/1.4, I would rather choose Distagon 35 1,4 ZM. and if you don’t need either, I would stick with Loxia. It’s not cliché, but all those lenses are outstanding and they rather differ than better each other. I didn’t test FE 35 1.4 thoroughly enough to make any bold statement though. 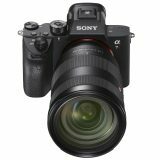 I have a problem with age related instable hands and because of this condition plan to purchase the Sony A7RII with its stabilization system. 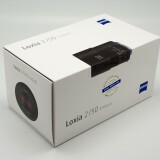 I also consider buying the Batis 25 or the Loxia 35. I would prefer Loxia because its MF brings me back to the times when AF didn’t exist and I also like MF. I tried very hard to use MF on my RX1, but the multiplication that jumps in, shows the effect of too much hand movements and makes it difficult to reach the best MF. I would like to know whether the MF of the Loxia on the A7RII functions better than the MF on my RX1, making it easier to get correct focusing? If not, I will buy the Batis 25. Thank véry much for your advise! sorry for the late reply, I was kind of busy those days. What you call multiplication (magnification of the image in the viewfinder) is a function of most Sony E mount cameras and it is called I think “focus assistant” and as such, it can be turned off. 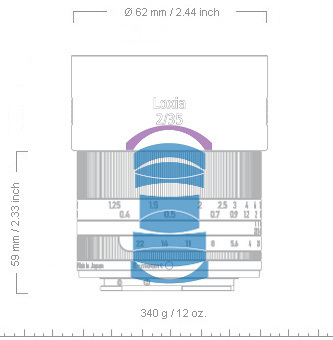 It works for all native mount lenses with electronic communication such as both – Loxia and Batis. In that regard, both lenses will behave similar and you can choose if you like that “auto magnification – focus assist function” or not. The difference is however in lenses focusing system – while Batis is focused by “wire”, Loxia has old fashioned (but very well dampened) mechanical focusing. Personally, I would always choose Loxia above any focus by wire lens if manual focus is what I prefer (and it usually is). 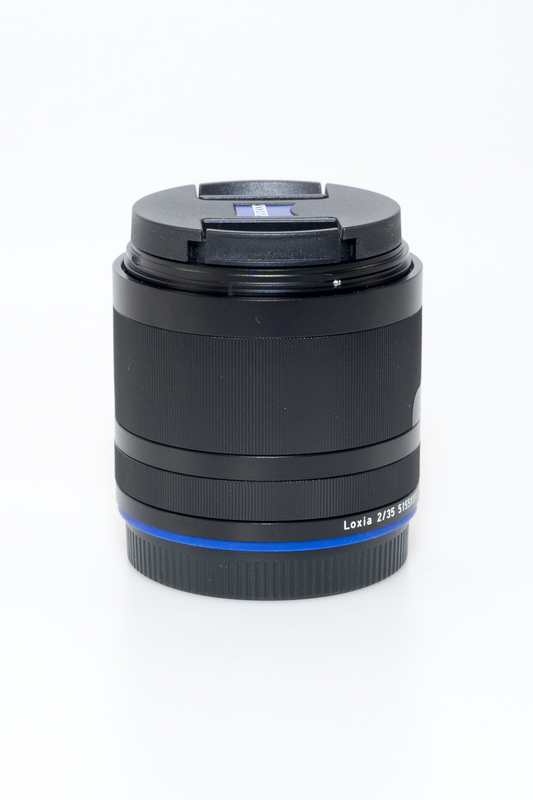 The tactile feeling of manual focusing Loxia is similar like with any Leica or Zeiss ZM lens. Batis is typical modern AF lens with electronically geared transmission in MF mode (focus by wire) and as such it needs either more patient photographers or those who think that MF means manually freaked, and they never use manual focusing technique. If you like manual focus, go with Loxia, but wait few days, Zeiss is about to announce new Loxia (among others) very, very soon! 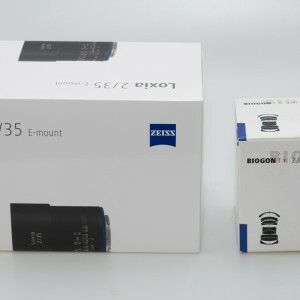 I haven’t tried Milvus 35/2 on Sony A7 but I tried Distagon Classic 35/2 ZE, which is essentially same lens. This combination works fine, but so does the Loxia 35/2, which is smaller and has some sort of weather protection. I am using classic Zeiss line in Canon mount (mostly) because via smart adapter I can get full EXIF, but there is now new Nikon smart adapter, that should do the same (I haven’t tried it). However, with all reservations to small FE 35/2.8, it’s not bad lens at all (except strong vignetting). I don’t know what you don’t like about your images, so I can’t give you any recommendations, but you should consider FE 35/2.8 too IMHO. Thank you so much for this detailed article. It is a pleasure to read your website. As far as I know, Zeiss ZM Biogon is a pretty traditional opt. structure, which avoids ASPH. I heard from other experts who’s saying that A7 series sensor suffers from lens without aspherical structure. 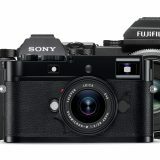 So, I really want to know if this Loxia is still better than Leica summicron 35 ASPH (with aspherical glass) attached on A7 series. Are you guys interested in this comparison? Thanks! Please write more articles like this. You are the man. A7 series (at least up to A7rii) had very thick sensor cover which in combination with microlens structure, caused corner problems (smearing and color casting). This shortcomming was most pronounced when lenses with symmetrical optical design, especially WA ones, when adapted. Aspherical elements are used in order to decrease spherical aberration and astigmatism. 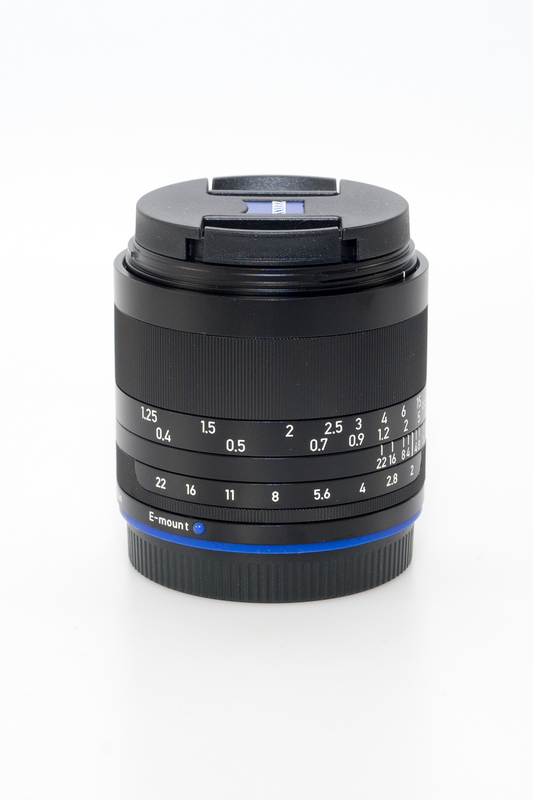 Lenses with aspherical elemnts are usually sharper from very wide apertures then similar lenses without it. 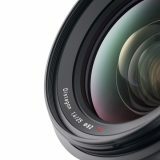 However, due to the injected mold technology used for production of aspherical lens elements (in most cases), circular highlights which are usually out of focus (bokeh), suffers from so called “onion rings”. There is no direct link between lenses with or without asph. elements and weak corner performance on Sony A7x, but there is relation between WA lenses with symmetrical optical desing and Sony A7 cameras. Loxia 35 is based on symmetrical Biogon ZM design, but there is additional corrective optics in its construction, specially designed for Sony A7 cameras, which drastically improves corner performance. 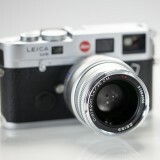 I haven’t had a chance to test Leica 35 asph. 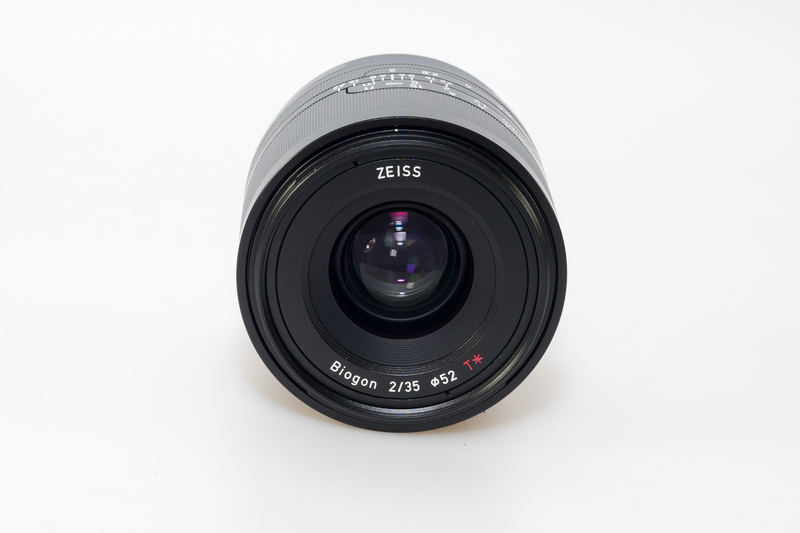 but I can strongly recommand Zeiss Distagon 35/1.4 ZM if you like RF lenses. Thank you very much for the great review. I haven’t seen anything as comprehensive as this to be honest. Looking forward to more. Thank you Yasser for stopping by and for your kind words.